During this time of the year sweet treats are everywhere you turn and my sweet tooth loves it :). If you are looking for something to bring to a get-together or party then a combination of chocolate and caramel is one you can’t go wrong with. 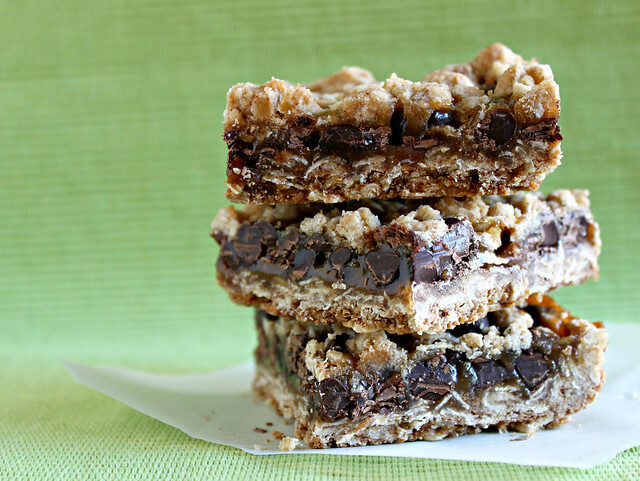 The gooey caramel, the chewy oatmeal, and delicious chocolate makes you go back for another piece. The recipe calls for 2 cups of chocolate chips, but I think it could have been better with just 1 1/2 cups. However, everyone else thought they were great the way they were! With that in mind, the recipe below suggests you use between 1 1/2 -2 cups, depending on your taste. Preheat oven to 350 degrees F. Line a 9x13 baking dish with parchment paper. In a medium bowl, combine oats, 1 1/2 cups flour, brown sugar, baking soda, and salt. Stir in butter and mix until combined. Reserve 1 cup of the oat mixture in a small bowl. Press the remaining oat mixture in the bottom of the lined 9x13 baking dish. Bake until golden brown, approximately 12-15 minutes. 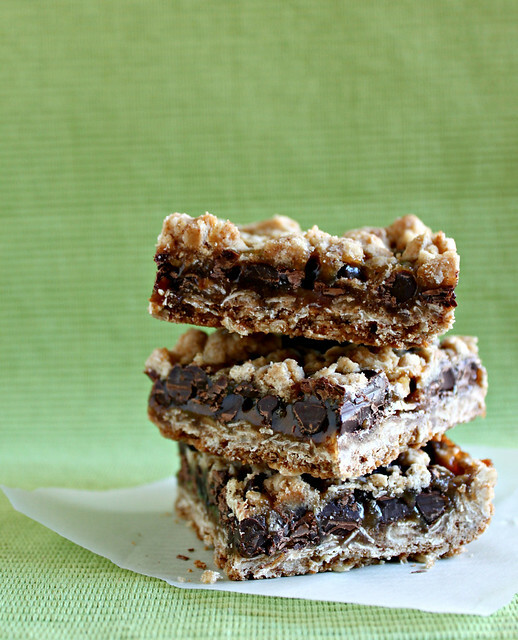 Sprinkle with chocolate chips and nuts. In a small bowl, mix caramel and remaining 1/4 cup flour. Drizzle caramel over chocolate chips to within 1/4 inch of the edges of the pan. Sprinkle with the reserved oat mixture. Bake for 18-22 minutes or until the top is golden brown. Cool in pan on a wire rack for about an hour and then place in the refrigerator to allow for easier cutting.